Heat oven to 400°F. Spray large cookie sheet with CRISCO® Original No-Stick Cooking Spray, or line with cooking parchment paper. Unroll pizza crust dough on cookie sheet; press dough into 13-inch round. Bake 8 to 12 minutes or until lightly browned. Meanwhile, in 8-inch nonstick skillet, mix oil, black peppercorns, red pepper flakes and bay leaves. Cook over medium heat 3 to 5 minutes, stirring occasionally, until bay leaves start to brown. Remove from heat; set aside. Cook spinach in microwave as directed on box. Drain spinach; cool 5 minutes. Carefully squeeze with paper towels to drain. In small bowl, mix ricotta cheese and spreadable cheese until well blended. Spread over partially baked crust. 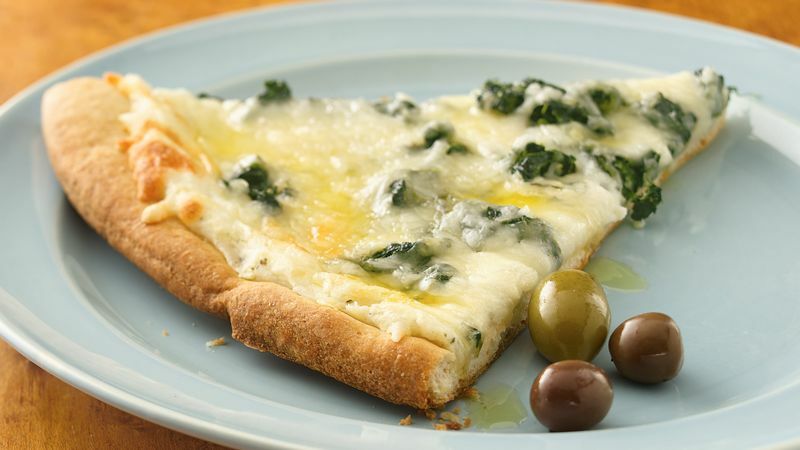 Top with spinach, mozzarella cheese and Swiss cheese. Bake 12 to 17 minutes longer or until cheeses are melted and crust is deep golden brown. Pour oil mixture through fine-mesh strainer into jar or small pitcher; discard seasonings. Drizzle each serving with oil.